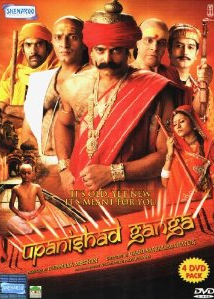 Episode #18 of Hindi TV Serial Upanishad Ganga is focused on Varn (aka Varna). The concept never tells that Brahmins are better than Kshatriyas who are better than Vaishyas who themselves are better than Shudras. They are metaphorically associated with different body parts, based on the skills/works they are best doing at. We can never say that the hands are better than the legs for that matter. Both of them are their own imporance in the body. And they both together makes the body functional in better manner. While keeping the society integrated, healthy and ongoing, actually four main things needs to be done. Now based on the skill sets (someone have a better brain and someone is good at muscles, someone can fight well and someone is exceptional at trading), people are used to given/taken the duties. And they need to work their level best, for the greater good of the society. The people who worked relentlessly to secure the society using their physical strength and warrior skills; administered segments of societies with their administrative skills, are named Kshatriyas. The people who are exceptional at trades, took care of resources needed by society by integrating skills, management, advancements and other stuffs are named Vaishyas. The people with good physical strength who can do grass root level work pretty well are named as Shudras. It is one of the (if not the) best segmentation or characterization – universal characterization – of mankind ever possible, right? The problem started when the characterization started “getting labelled” rather than being “earned or chosen”. Eventually it became the tradition that a Brahmin’s son would be a Brahmin and a Kshatriya’s son would be a Kshatriya (and so on), regardless of the area of expertise of the person him/herself. It resulted into some incidents which are shameful for the culture. Episode #18 tries exploring the “universal characterization” with the story of Chanakya and Chandragupta. While settling down the things after the war with evil forces, Chankaya was at the peak of his efforts to setup a proper kingdom in Magadh and looking forward for uniting entire BharatVarsh under one rule; he got a message. It was important intelligence input which have suggested that plan to declare ChandraGupta Maurya as the emperor of united BharatVarsh is not welcomed by scholars. Chanakya got furios by hearing it. He asked for the reasons and he got even more angered by hearing them. The scholars was unhappy to let ChandraGupta become the ruler because he belongs to the Shurdra varna. Chankaya have asked with the immediate effect that, fire the villages which oppose the decision. He even went ahead and grant licence to kill anyone (including Brahmins, who were considered as un-killable) who opposses the greater good of the motherland. However Chanakya was a wise fellow, and like Lord Krushna (aka Lord Krishna) took a chance to meet Duryodhan and Kauravas once before the great war of Mahabharat, he decided to meet the scholar Brahmins once before giving free hand to armed forces at his disposal. During the meeting he remain calm and composed yet firm on his decision. He logically argued that the wrong interepretation of Vedas lead to wrong concept. He than logically proved that the Varn (or Varna) – the Characterization – was intended to be done by the skills and abilities, not by the birth. So will he be able to convince the brainwashed scholars with his logical input? That is the rest of the episode. What a thought provoking episode it is. It clears a lot of myths and misconception in illeterate or especially half-literate scholars of Hindu mythology. The content is written so well, it require nothing else. The small yet effective dialogs add to the positives of the script. As the content is setup in Chankya-Chandragupta time, the dialog writer was needed to be careful about using several words, which he failed at a few places. Though overall, he is in control of it, so we can avoid some small misses without a doubt. The background music is fantastic. There are no larger than the life sets and you will never feel a requirement of that as well. The lifestyle and time of that era is explored quite authentically by the makers on screen. The episode is have some fantastic performances which makes is memorable. The entire episode flows mainly on the shoulders of K. K. Raina. And you got to know what a fantastic actor he is! His body language and dialog delivery conquers everything. He is given good support by Amit Bahl, Abhimanyu Singh and others. The episode is written with a clear vision and it’s execution makes it succeed in achieving it’s goal. The DVD quality is good and both audio and video are enjoyable. You should not miss this episode. It is worth your money (if you buy the DVD / or the bandwidth charge you pay, if watch on the Internet) and most importantly your time. It proves that when there is good content is there and talented team is executing it, you don’t require anything else.